"To The Future, With An Elevator"
On 25 October, our company was invited by Tartu University to present the salt cocoon at the seminar for entrepreneurs called "To The Future, With An Elevator". The seminar was organized by the Enterprise Estonia. The Enterprise Estonia funded our innovation project with Tartu University in order to study the characteristics of the salt aerosol, produced by IIRIS-136 salt generator, inside the salt cocoon. In result of the project, we have an updated version of IIRIS-136 with 3 pre-set regimes of operation. Each regime provides different salt aerosol concentrations. 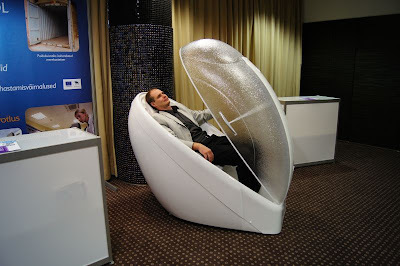 At the seminar, people could familiarize themselves with Saltarium salt cocoon. I gave an interview to the Estonian Public Broadcasting about the project, about salt therapy and about the salt cocoon - an innovative device for personal salt therapy. This article, published in Estonian Postman (Postimees) in 2003, starts with the story of a 2,5 years old Hanna Simona who got relief from salt therapy to her exhausting bronchial asthma. Now, she doesn’t have to use so many drugs as before. “Hanna Simona’s immune system has really become stronger” explained her mother Jaana Allas who confesses that at the kinder garden, Hanna used to be the first who catches a virus or a cold. 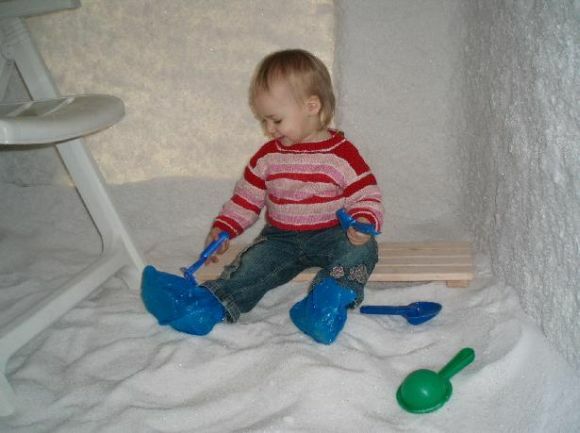 When her mother notices some signs of the coughs, she immediately hurries to the salt room. Usually, the relief is noticed after 2 weeks but this time, 2 days already gave the positive result. The ear-nose-throat doctor Ljudmila Fjodorova explained that salt therapy is a good way to prevent viral diseases. Meanwhile, Dr Fjodorova reminded that everything depends on the diagnosis. For example, in case of strong asthma (or any other serious illness), one should not quit their drugs. 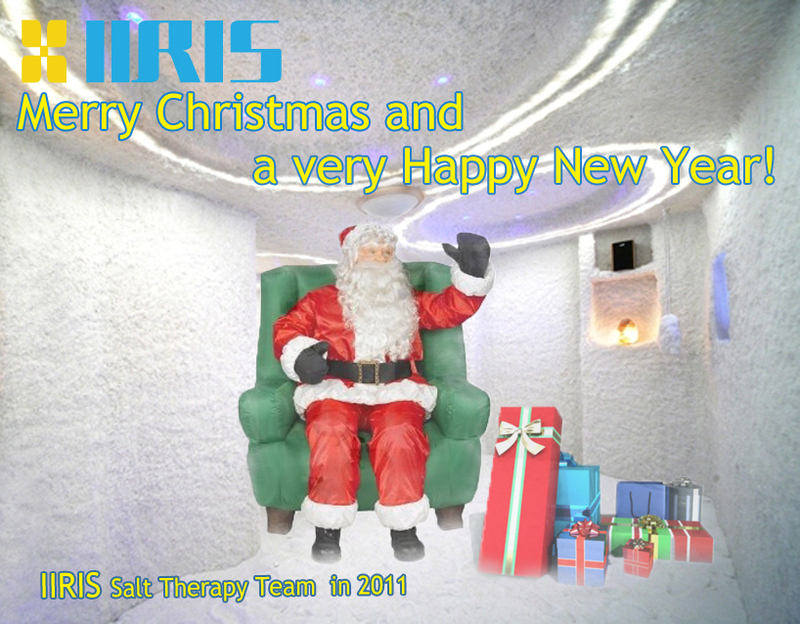 The owner of the salt room Ms Juta Käärik is motivated by the patients’ satisfaction and opens up a second salt room. “People with skin diseases sometimes want more privacy” she explains. The nurse at the salt room, Ms Eda Suits, has also heard much content from the patients: the improvement has been noticed in case of the inflammation of the sinus(es), breathtaking asthma, acute skin diseases and even the infection at the root of the tooth. Usually, the disease becomes aggressive for some time after the session(s) in order to completely back away afterwards. The salt therapy relives asthma and chronic bronchitis; infections in upper respiratory system and sinuses; chronic colds, cough and tonsillitis; skin diseases; allergic infections; stress, insomnia and anxiety. Salt therapy is not recommended in case of acute viral diseases and high fever; tuberculosis; heart failures. Halotherapy is a method of treatment, especially effective for respiratory diseases. The most commonly used as a complementary form of therapy in asthma, often independently of respiratory infections, particularly upper respiratory tract. Parents are interested in this form of therapy when it comes to their children, since it is a treatment method that has a small number of contraindications and side effects and children does not constitute trauma. From our experience, most patients are children of kindergarten age. Halotherapy is effective on infants, especially in eliminating the accumulated mucus in the upper airways, during banal respiratory infection. Given the specificity of infancy we suggest caution and the mandatory inspection and good cooperation by the personal physician before you begin halotherapy. There is also a need for constant medical supervision which is necessary for medically trained personnel in the salt rooms. To achieve a therapeutic effect suggest 15-20 treatments (certainly not less than 10).After first few treatments there may be an initial worsening of symptoms in terms of intense coughing, wheezing, that is in most cases, the expected transient response after reaching the elimination of secretions from the respiratory tract and does not require discontinuation of therapy. Access to the patient should be individual, in this sense of salt concentration, frequency, length of therapy depends on age, type of disease and response of the individual. Most of the research of halotherapy effect on respiratory diseases have been conducted on adults. Since children are more frequent users of halotherapy, further research should be in the pediatric population. The following article was published in 2001 in magazine The Family and Home & in Estonian web-based women newsletter The Women World. It starts by saying that in life, it is often so that everything new is actually the long-forgotten "old". The same applies to the salt therapy: its effects were known centuries ago but in modern Estonia it is a new method which was introduced to people just few years ago. 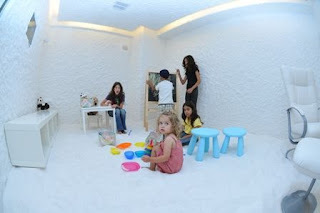 More precisely, the salt rooms were first introduced in Estonia 6 years ago (eg 1995). They were first built in sanatoriums but later also in health centers as well as Tallinn's Children Hospital (= the biggest children hospital in Estonia). Dr Lea Salistu tells that the salt rooms suit especially well for the asthmatics: the sputum can be coughed out, the gasping lessens. The tiny salt particles also kill bacteria and fungi on the skin and reduces the mucosa swelling. Sometimes, people start coughing even more. This should not be taken as alarm - quite the contrary - it is part of the healing process. The nurse who administers at the salt room, Ms Ludmilla Kostenko wotnesses that she has not suffered any viral diseases for couple of years (due to the difficult climate, most Estonians have at least some kind of virus every winter. In case of children, it is even more frequent). -high blood pressure (this is being argued). -is it a good time for salt therapy or the patient should continue with the prescription medication for right now? -is the administration of salt therapy justified? -how high the salt aerosol concentration must be? The heading of this article is a bit funny but in Estonian language, the arrest chamber or the detention room is called the "salt kiosk". So that's why the heading is such. Anyways, the article was published in 2001 in Estonia's second most read newspaper - The Estonian Daily News. It reminds people that salt is not just spice - it is a disinfecting agent which kills germs. Being in salt (aerosol) helps to prevent respiratory diseases and throat infections. It facilitates the life of asthmatics and gives relief in case of allergic skin diseases. Overall, it reinforces the immune system. The article describes promptly how the system works: the salt is being sprayed to the room by the special machine (=the halogenerator). It produces tiny, tiny particles which are capable of penetrating to bronchi of different diameter. The effect is that those tiny salt particles liquefy the secretion and in result, it can be coughed more easily. "Salt Therapy Reinforces Your Health"
Estonian Daily Newspaper - the second most read newspaper in Estonia - published this article already in 2001. "Salt room is like the magic land of the Snow Queen...expect that the white on the walls is salt and it's not cold in the salt room." After few sessions in a salt room, the asthma sufferers are able to breathe easier and children' cough becomes loose (due to mucous release). The manager of the Järvamaa Rehabilitation center, Mr Vaher, assures that it is not necessary to grasp the air while in the salt room. A person can totally relax and sleep for 45 minutes if he/she wishes. The children can play with trucks in the snow, eg salt transportation, or build the salt caves for their toys. Further on, the article explains that salt therapy is the most effective in case of asthma and bronchitis. "The salt aerosol enables to cough out the mucous and it enhances the breathing." Mr Vaher also tells about the patient who came with acute sinusitis and already during the 4-5th session, the inflammatory fluid started to come out through the patient's nose. The nurse Ms Krais tells that many people come to salt room for prophylactics and afterward they confirm that colds and viral diseases don't affect them so easily anymore. This applies very well to children whose resistance to diseases gets reinforced. Ms Krais also states that some people don't feel anything after 14 sessions but later on they admit that their health has really improved. 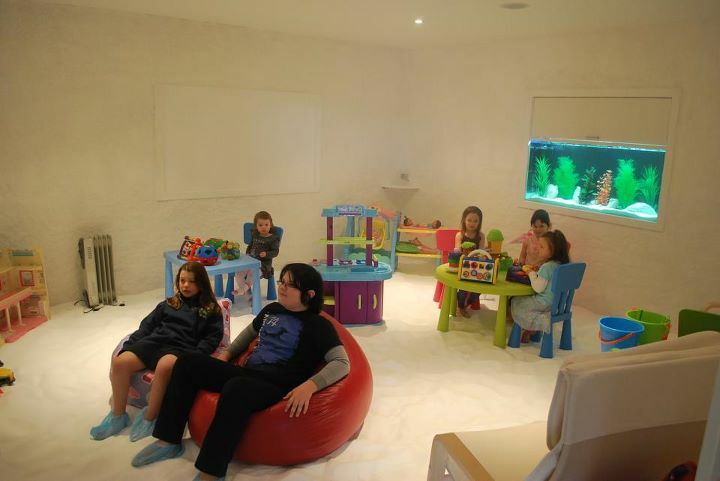 The costs of salt therapy in a salt room in case of asthma and bronchitis are covered by the Estonian Health Insurance Fund. For other diseases, the patient has to pay himself.